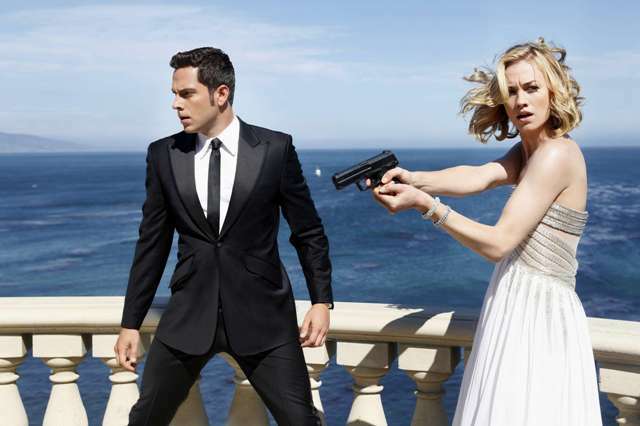 Episode Review: CHUCK, "Chuck vs. The Zoom"
It's finally here; Season 5 of Chuck has begun! While I wouldn't say that "Chuck vs. The Zoom" was the show's best episode, it was a good bridge from last year's finale to what we're going to be getting during this final go round. From a story standpoint, "Zoom" was pretty straight forward. Some time has passed since Hartley Winterbottom gave Chuck and Sarah a billion dollars as a wedding present, and Chuck ended up squandering most of it on Carmichael Industries and on fresh shrimp for the new Intersect AKA Morgan Grimes. It seems like Team Bartowski's new business venture has not been doing well, so they've had to take jobs retrieving expensive vases from Luke Skywalker with little to no actual payment. To keep Carmichael Industries afloat, the team was hired by a lawyer who was swindled out of $20 million by a Ponzi schemer known as Roger Bale (or the Guy Formally of The Daily Show Who Was Formally of Sporstcenter). After Morgan used the Intersect to play squash with Bale, he and Sarah were invited to an exclusive party which was where they were going to get their clients money back. Unfortunately for Team Bartowksi (or is it Team Carmichael now? ), their old nemesis Clyde Decker had used them to freeze Bale's assets which included their remaining money. Oh, and Bale had captured Morgan, Sarah, and Casey to boot. It was up to Chuck to save his friends, so he posed as Nerd Herd to get into Bale's compound. While there, he was able to bargain for his team's lives by threatening to lose all of Bale's money, which he ended up doing anyway while making a daring escape. When it was all said and done, Carmichael Industries was still a live, but the company was broke which meant Chuck and Morgan will have to work at helping the Buy More turn a profit. All of the spy shenanigans had a very different feel now that they are no longer working for the government, and honestly the set-up so far feels an awful lot like Leverage (which I kinda predicted, not that I like to brag). I'm by no means complaining about the new approach since it makes sense based on last season's finale, but I do wonder if it's a sustainable change. Some of the other paradigm shifts may take longer to get on board with though. I haven't hid my feelings about Intersect Morgan. Since I've never been a fan of the character, although he ended up growing on me as the years went on, giving Morgan such an important role on the show made me nervous, and my hesitations were not alleviated after "Zoom". My major issue with Morgan with the Intersect was the fact that he somehow magically learned how to use it so quickly. It took Chuck almost five years to get used to the Intersect, and Morgan picked it up over a few months? I don't know about that one. One of the positive aspects of the role reversal will be watching Chuck deal with not having the Intersect, and how he'll define himself now that he's a regular spy. The strongest moments of "Chuck vs. The Zoom" were the ones that addressed this shift in Chuck's self-identity. He saw Morgan function fine as the Intersect, and he wondered what he can contribute. Thankfully, Ellie and Sarah reminded him that he's more than just the Intersect, but I'm betting we're in store for more of his rough transition back to normalcy. Mark Hamill was Chuck Stunt Casting at its worst. I still don't know why people don't give this show as much crap as they do to Glee when it comes to stunt casting. Do we really still need the Buy More? Oh, I guess we do. Operation Toes In The Sand. Enough said. Rush Limbaugh! Ha! I've missed Casey's right-winged nuggets of goodness. Chuck Bartowski Marriage Tip of the Week: Lie to your wife so she can seduce the truth out of you. This was a character heavy episode as we also learned more about Sarah and her dream house. Morgan's baseball rant was some unintentional hilarity. That last action sequence was pretty sweet. I'm still think having the government chase after Chuck has a lot of potential. "We're still working out the kinks." "I want it noted that I took out six of their guys." "Do you actually play any non-video game sports?" Morgan: "Did I do great?" "Chuck vs. The Zoom" may not have been the strongest episode of Chuck, but it was able to establish this new adventure for Chuck and his friends. It also gave us some good character moments, which I'm always a fan of. Regardless, it's great having Chuck back on our TV screen, and I cannot wait to see where Season 5 takes us. << Next Episode: "Chuck vs. The Bearded Bandit"